Chances are..if you clean your house, you might just have a multitude of cleaners under your cabinet. OR, in your laundry room. OR scattered around your house. One of the BEST ways to save money is to make your own cleaners – truthfully, there isn’t anything that you can’t make yourself that won’t do better than store or name-brand varieties. There really isn’t… as long as you have baking soda, vinegar and peroxide at home you can really clean just about anything. Although I do make many of my own cleaners and have for some time, the only cleaner that I actually Do purchase for my household is Thieves Cleaner – and it lasts a long time. LONG time! 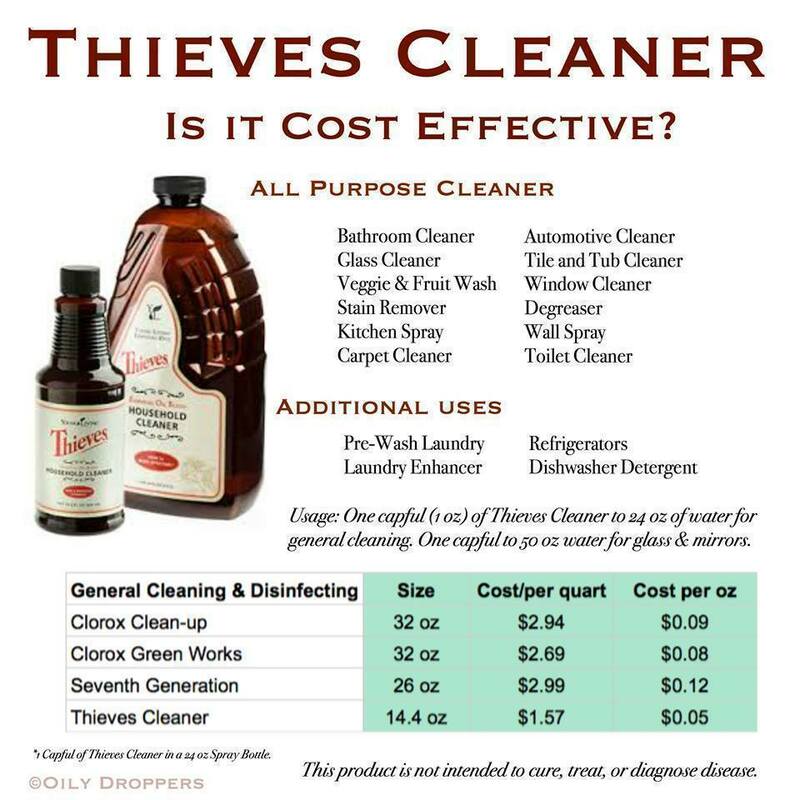 Now… obviously I’m a huge fan of Thieves Cleaner because I’m a huge fan of Young Living… but in all honesty , every time I share this cleaner with family or friends, they are always fast to mention how much they love it too. Thieves Household Cleaner is a plant-based cleaner that is an ALL in ONE ~ it is made of plant and mineral based ingredients and is very concentrated. Biodegradable cutting agents with ingredients that are rated as a 0 on the Environmental Working Group’s Health Hazard Score (which runs 0 to 10 – 10 of which is being the worst, and 0 is the “best”).. The best part of this cleaner is that (as mentioned) it’s concentrated – one capful to 15 oz. of water will allow you to stretch the bottle a long ways. 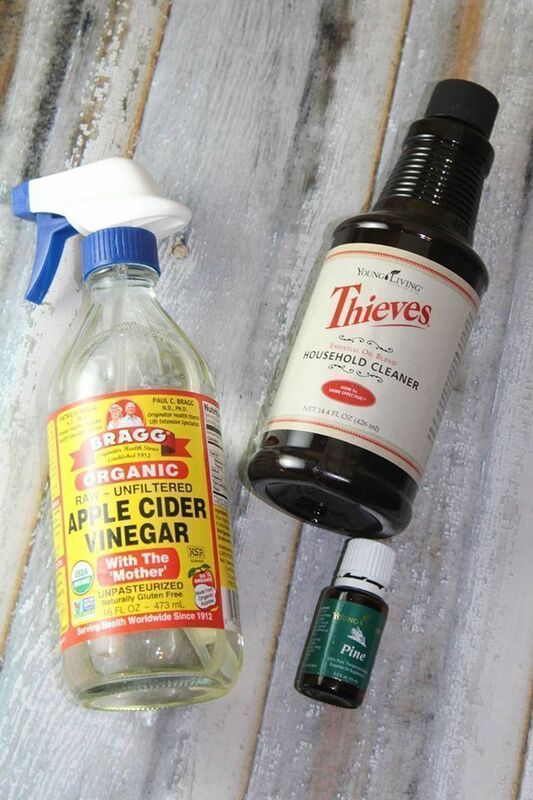 Use old Thieves Cleaner bottles re-fashioned with a new spray bopper to make a bottle for each room of the house. OR, use an old Bragg’s Apple Cider Vinegar Bottle with a spray topper too. We use Young Living for ALL of our Oily needs ~ if you are interested in using Essential Oils for your personal care, wellness, or home, Young Living offers a tremendous opportunity to score their oils at wholesale cost (24% OFF) when you buy the premium starter kit (which includes 11 popular oils, a diffuser and samples of various other items). Not to mention, when you purchase the starter kit, we will send you $40 in FREE items including an Amazon Gift Card, and reference materials to help you get started on your oily journey, in addition to access to several Facebook groups for training, too. Find out how to buy Essential Oils at Wholesale Cost (24% OFF) + earn $40 in Bonus Goodies, too! Share the post "Thieves Household Cleaner (Is it Cost Effective?)"